John Webster’s 400-year-old revenge tragedy “crackles with wit and insight”–but Cameron Kelsall finds that the production fails to live up to the possibilities. Women pay for the crimes of men in The White Devil, John Webster’s overstuffed revenge tragedy. Perhaps that explains why the 1612 play, once a relative rarity, has become a hot commodity in recent years. As with modern productions of Shakespeare, a skilled director can draw parallels to our current moment, and this story of how lust and hubris ruin lives and kingdoms all but demands such a comparison. Red Bull Theater’s new production at the Lucille Lortel—handsomely reconfigured in a three-quarter thrust design—is my third in about as many years. I found myself grateful to be familiar with the piece, since Louisa Proske’s direction often renders an already convoluted plot impenetrable. (My companion, a theater-savvy professor and longtime newspaper critic, confessed a lack of comprehension at intermission.) Those without foreknowledge of Webster’s drama should arrive at the theater early and carefully read the several synopses included in the Playbill, which illuminate the twisting structure of the story—or failing that, press Wikipedia into service. Little that occurs onstage in this production, which updates the action to a vaguely contemporary setting, will provide the necessary clarity needed to understand, much less enjoy, this bloody tale. In short: The Duke of Brachiano (Daniel Oreskes) conducts a tumultuous affair with Vittoria (Lisa Birnbaum), the title temptress, and their passion leads them to plot the murders of their respective spouses in an attempt to be together. Spoiler alert: It doesn’t end well. The body count piles up across the evening, along with Vittoria’s sojourn at a convent (a place for unrepentant whores, we’re crudely told), a subplot involving an ambitious cardinal (there’s always one of those in a Webster play), and a deus ex machina centered on the duke’s teenage heir. Still with me? The strong proto-feminist subtext of Webster’s play largely gets obscured here due to muddled stage business. When the Catholic Church puts Vittoria on trial for the affair but absolves the duke, Webster comments on the heavy burden women carry—a weight not equally shared. “Condemn me for that the Duke did love me?” Vittoria asks Cardinal Monticelso (Robert Cuccioli), who presides over her trial, in a moment of cutting clarity. But Proske’s staging of this moment, and many others throughout the evening, favors striking images or technological bells and whistles over straightforward storytelling. At many points, the proceedings resemble a downmarket pilfering of Ivo van Hove’s aesthetic. 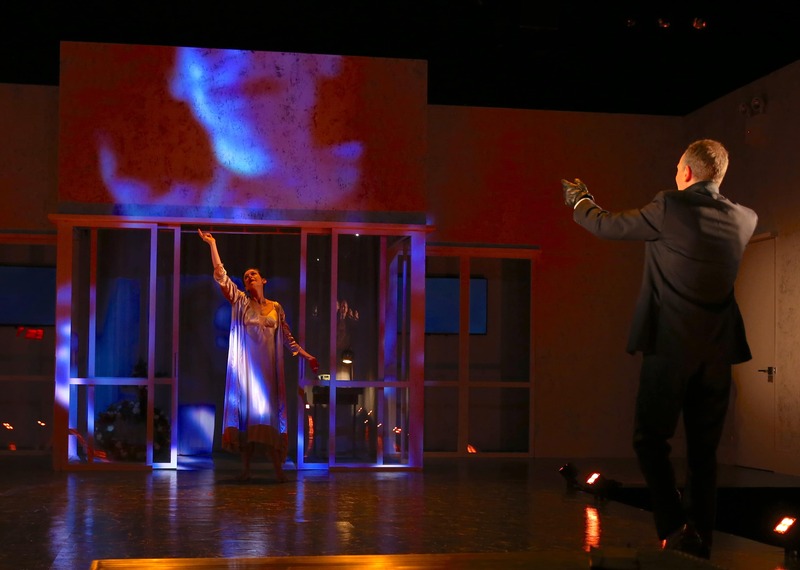 (An ensemble member even roams around the stage at one point with a camera, projecting the scene onto the grey walls of Kate Toll’s austere unit set.) Anachronistic costumes (by Beth Goldenberg) and distracting video design (by Yana Birÿkova) are employed haphazardly, in a manner often visually arresting but rarely connected to an overall idea or understanding of the text. Proske seems to have started with a concept that she foisted onto this play with scant regard for whether or not it fits. Don’t even ask me about the scene where the entire company—which also includes Off-Broadway veterans like Jenny Bacon, T. Ryder Smith, Derek Smith, and Socorro Santiago—don virtual-reality goggles and enact a role-playing video game. The lack of clarity filters down to the performances, causing usually reliable actors to offer strangely tentative, unmoored characterizations. Oreskes projects gravitas and malevolence in certain moments, but more often than not, he pushes too hard toward comedy in a way that undercuts his authority. Cuccioli, who has impressed me as a classical actor in multiple productions at the Shakespeare Theatre of New Jersey, comes across as little more than a standard-issue villain here. Perhaps due to directorial choices that obscure Vittoria’s centrality, Birnbaum barely registers as the drama’s moral compass. More than 400 years after it first appeared on the Jacobean stage, The White Devil still crackles with wit and insight. But if this production serves as your introduction to the piece, you might not know that. Webster’s play doesn’t need to be made relevant—it already is. Trust the material.